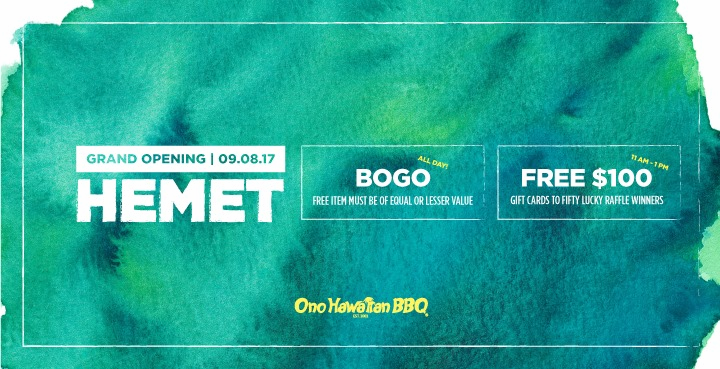 Ono Hawaiian BBQ, which is celebrating its 15th anniversary this month, is basically offering its guests $15 in free food today (October 17), its anniversary date. Here’s how it works: While supplies last, guests who spend $15 on food and drink at regular price today will receive $15 in Ono Bucks to use through the end of the year. Chino’s Kealoha’s Taste of the Islands & Mai Tai Lounge hasn’t been open very long, but they’re already in a generous spirit. 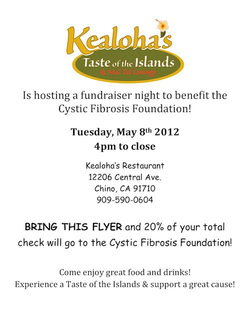 Tomorrow night (May 8), the restaurant is hosting a fundraiser for the Cystic Fibrosis Foundation. All you have to do to participate is bring a copy of the flier (at right) any time from 4 p.m. to close and Kealoha’s will donate 20% of your check to the foundation. Double bonus for karaoke fans, as Tuesday night is Karaoke Night from 8 p.m. ’til closing. Kealoha’s is at 12206 Central Ave., Chino, just north of the 60 Freeway. For more information, visit Kealoha’s Facebook page or follow ’em on Twitter. Kealoha’s Taste of the Islands & Mai Tai Lounge is saying aloha (as in hello) tomorrow (March 15) at 4 p.m.! The Chino restaurant replaces the former Honolulu Harry’s at 12206 Central Ave., just north of the 60 Freeway. Owner Preston Kealoha previously worked at both the Chino and Corona Honolulu Harry’s locations, eventually serving as manager. Kealoha’s aims to bring the “Island Spirit” and the finest Hawaiian cuisine to the Inland Empire. The restaurant will be open for lunch and dinner daily and Hawaiian buffet from 11 a.m. to 2 p.m. Sunday. For more information, visit Kealoha’s Facebook page or follow on Twitter. It seems that there’s a rash of restaurant closings and openings these days. Another casualty is Chino’s Honolulu Harry’s, which at one time also had a location in Corona. Kealoha’s Taste of the Islands and Mai Tai Lounge, owned by former Honolulu Harry’s manager Preston Kealoha, is set to open this month. Kealoha’s is at 12206 Central Ave.